When you turn your next party into an Oktoberfest celebration, serve bratwurst, potato dumplings, sauerkraut and, of course, beer. Germany's renowned Oktoberfest takes place for 16 days from the end of September into October. To duplicate the festival for your own party, use traditional colors and serve authentic German food and beer to guests. Traditional colors for the German Oktoberfest party are blue and white to represent the Bavarian flag. Decorate your party with blue and white tableware, balloons and festive streamers. Blue and white streamers can decorate the inside of your home to create the atmosphere of the German festival. Also incorporate red, black and gold, the colors of the German flag, in dressing up your party for festivities. You can incorporate ribbons adorning furnishings in your rooms. Decorate your porch or deck to accommodate party goers who end up outside during the party. Hang blue and white banners outside your home to welcome guests to your Oktoberfest celebration. Hang posters of Germany around your home to put guests in the mood for a German celebration. Travel posters work well for a German-themed party. You can find reproductions of vintage German travel posters in stores that sell art prints or online at sites such as Amazon.com or AllPosters.com. Use the colors of the German flag or the traditional blue and white to decorate your party table. For instance, lay out a blue tablecloth and white napkins to create an Oktoberfest table. Include beer steins on the table to hold flowers. Beer steins can anchor bouquets of blue and white balloons, as well. Create bouquets of balloons to place on either side of a buffet style table. 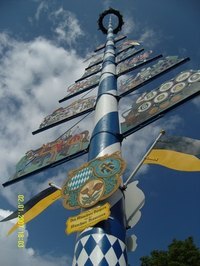 Use signs in German to show guests where to find the beer and food as you would find at the outdoor festival in Germany. Signs used in the Oktoberfest festival may show guests where to find the "Biergarten." Food labels identify the German dishes you are serving during your festival such as "Party-happchen" or party appetizers.